WASHINGTON, Dec 27 2013 (IPS) - For the first time in its 85-year history, the Egyptian Muslim Brotherhood Wednesday was declared a terrorist organisation. The provisional government’s decision, presumably with the military junta’s approval, came after two deadly bombings in Mansura and Cairo. The MB is not just a political organisation, as these hardliners maintain. It’s the most visible and credible face of civic Islam in the country. The government’s action against the MB will have far-reaching implications, both short-term and long-term, for Egypt and ultimately for the U.S. Declaring the MB a terrorist organisation is a short-term victory for the hard-liners within the junta and the provisional civilian government who have vowed to crush the MB. But it is a Pyrrhic victory because since the 1940s, every Egyptian government that clashed with the MB failed to crush it. The MB is not just a political organisation, as these hardliners maintain. It is a social, religious, educational, healthcare, and cultural movement. It’s the most visible and credible face of civic Islam in the country. It is also the largest and most-disciplined Islamic political society in the Arab and Sunni Islamic world. The MB has penetrated Egyptian society, especially in the lower middle class and poorer neighbourhoods, through a myriad of non-governmental organisations. These groups provide food, healthcare, childcare, and education for free or at affordable costs. Furthermore, millions of middle class, professional Egyptians benefit from the medical services of MB-run hospitals and clinics. The government’s short-sighted decision branding the MB a terrorist organisation will force all these services to stop, leaving millions of Egyptians without health, education, and welfare services. These abrupt hardships would push people to the streets, creating a new wave of unrest, violence, and instability. The government’s action is not expected to stop public demonstrations against the military despite the rising wave of arrests of MB members and sympathisers. As more MB leaders are detained and as communications between the leadership and rank and file are interrupted, younger and perhaps more radical members of the MB will hit the streets. 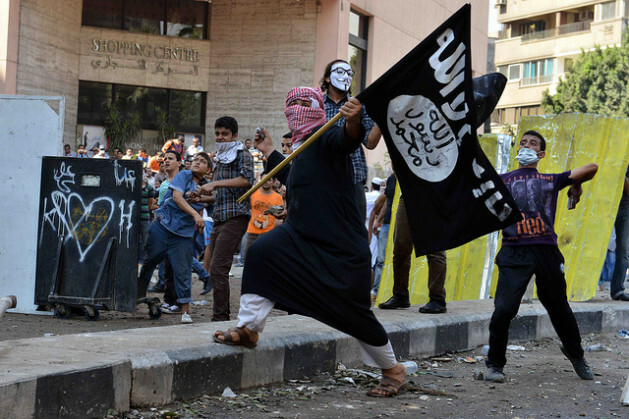 Egypt will experience a heightened level of chaos and insecurity. Declaring the MB a terrorist organisation will also have serious negative implications for the United States. Hard-line supporters of the military will likely accuse the U.S. of coddling the MB, and MB supporters would turn against the U.S. for its perceived support of the military. U.S. personnel and facilities in Egypt will be targeted by regime thugs and by potential terrorists. The U.S. State Department’s mild rebuke of the junta’s action – voicing its support for “an inclusive political process” and calling for “dialogue and political participation across the political spectrum” – will fail to satisfy either the military or the MB. Washington should make it clear to the junta that political stability in Egypt cannot be achieved by excluding the MB and its affiliates from the political process. In fact, Washington has been engaging the MB since the early 1990s when the organisation decided to shun violence and participate in Egyptian politics through elections despite frequent objections from the Mubarak regime. The U.S. should continue to do so regardless of the junta’s ill-advised decision. irrespective of the fact that Muslim Brotherhood has deep political and social roots in Egypt, or elsewhere. Look at the Turkish Justice and Development Party led by Erdogan, which became the first Sunni majority governing party in the region, emerged as the poster child of an Islamist party in Europe that was, until recently, acceptable to the West. It existed a decade or so because it governed democratically, and being a Sunni Islamist party, defended Turkish secularism, and encouraged inclusion in the economic and political life of Turkey. Despite of its Islamic roots, AKP supported the democratic notion of separating religion from politics. When it changed its policies towards more radicalization, it begins to suffer. So, is the case for Egypt, since the beginning. 1. Egyptians wanted to rescind the sham constitution and replace it with a constitution that reflects the diverse political ideologies in Egyptian society. 2. They wanted that the MB government should include secularists, women, Christians, and non-MB leaders in high positions in government and promote a national programme of tolerance toward these groups and punish those who engage in sectarian and gender hate crimes. 3. They wanted the MB government to hold open, free elections for the next parliament, with much simpler and straightforward voting procedures and without stacking the decks in favour of the Muslim Brotherhood. women in start-up initiatives in technology and entrepreneurship to develop businesses and create jobs. The young generation wanted that they must have tangible incentives to have a stake in society in order to help build a prosperous future. leaders, men and women, from across Egyptian society from the business, banking, and tourism community, the professions, civil society, academia, and the high tech industry, with different political, social, and religious ideologies to discuss the immediate future of Egypt and develop specific strategies of how to get there. vision of Egypt, Egyptians thought they’ve made a wrong choice. So, the developments are. If the MB was to retain power, they must had to take concrete steps to alleviate citizens’ concerns, create jobs for the youth, and partner with leaders of different ideological stripes to build a more democratic Egypt. But they didn’t. As Egypt is endowed with a rich culture and a diverse social fabric, and as it could not possibly prosper under a theocracy, they supported the overthrow of the MB by their military. Afterward, what they did so far only proved that they, maybe, are just a ‘terrorist’ organization, not a political party that can get onto power and can handle a country whose demands are farfetched. Ironically, part of your argument against banning them is my basis for my argument for banning them. Specifically, you state “The MB has penetrated Egyptian society, especially in the lower middle class and poorer neighbourhoods, through a myriad of non-governmental organisations”. Mubarak corrupted Egyptian society by creating a system where the poor feed off the rich via bribes and undeserved incentives just so that the government can wash it’s hands off the problem. The MB is no different. They don’t provide these services out of the generosity of their hearts. In return for these services they expect blind loyalty and obedience (hence, the term “sheep” that they are labeled by). Imagine for instance if the Republican Party in the US decides to launch a program where it feeds the homeless in return for their votes in the upcoming elections. What kind of democracy would that be? Oh, and to solidify that support, they would add a twist by saying that they speak on behalf of the Christian religion and that to reach paradise you have to vote Republican next election. That is exactly why the majority of Egyptians are for the decision to brand a party that manipulates the poor and the ignorant to give their allegiance to a party that serves only its members and shuns that oppose it. For example, did you know that as an MB you are given a list of where to do your groceries, which doctors to see, what teachers to seek for tutoring, etc? Of course this list consists only of other MB members and God forbid that any of these be Christians. Don’t they call that racism in the west? The MB is a cancer that is spreading in Egypt. Yes, taking it out will be painful and will require sacrificing some organs but in the long run it’s the only chance for survival. Based on what u said, because of the MBs failures, now since the military took over, and they know EXACTLY how to run the country, there should be jobs flourishing like no tomorrow. Future for all the kids that take private lessons and tip there teachers so they could cheat on tests. I’ve never heard of a more failed system, both in education and socially. What are the kids learning that cheat in order to pass? There is always a way around the system in order to get to the next level…i just have to play my cards right!! Sorry, but if you have to cheat to get your way thru life, your a person of failure, in a community and in a city and in a country that is failed. So until egypt gets a president that is against all of this…the country will still be corrupt. Egypt needs douas…and a miracle from Allah swt.